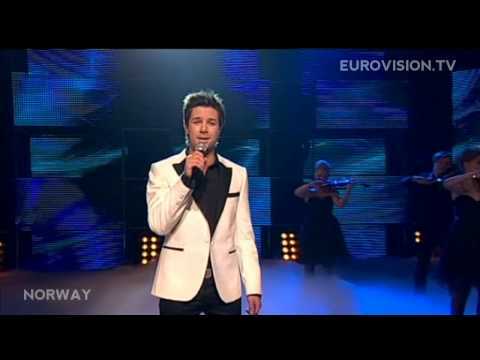 For three times Norway won the crown of the Eurovision Song Contest, finally last year in Moscow with “Fairytale” sung by Alexander Rybak. Alexander has been following The Bobbysocks with “Let det swing” in 1985 and Secret Garden with “Nocturne” in 1995. “Fairytale” was a clear winner and the whole country was proud having such a charming and convincing winner, which has become popular all over Europe. Norway is taking part in the ESC since 1960 and was generally less successful in the beginning. Norway was the typical 0-Points country. Over the years Norwegian entries developed a certain Scandinavian charme. The songs came up with all kinds of music styles: rock, schlager, pop, folklore and ballads. Due to Alexander Rybak’s overwhelming victory, Oslo will be the host city this year and is taking the country’s pride like 1996. This year’s song “My heart is yours” will be sung by Didrik Sollig-Tangen, a very young and charismatic performer. He could convince the Norwegians in the big final of the Melodi Grand Prix in early February. After a long pre decision marathon the public has decided that this song is going to be the host country’s representative. From the 1996 ESC we know that the host country could do very well, Elisabeth Andreassen has come 2nd with “I Evighet”, supported by a big applause and home field advantage. This could also happen this year, as Norway does not have to qualify for the final. As the host country is always qualified for the final automatically including the Big 4 countries like France, United Kingdom, Germany and Spain. The song “My heart is yours” is a strong and quiet ballad with a gradient final, which sounds like an anthem, similar to “You raise me up”. The good looking singer will have the fans on his side. How this song will end up depends on the strengths of the competitors. Good luck Norway.